Psalm 90:12 states that we need to “number our days, that we may gain a heart of wisdom” (NKJV). What does this mean? One well-known commentator on Psalms says that God instructs us to estimate our days (their number); the rapidity with which they pass away; the possibility that they may be shorter than we think; and the certainty that, in any case, they must soon come to an end. He further says that our prayer should be that we might gain the wisdom to live as if each day could be our last, for indeed it might be. Seeing that our time on earth is short, what should we be doing? First, we need to make the most of every opportunity and not waste this precious gift. Imagine that you had a bank that would put $86,400 in your account every morning. You would be required to use all of it that same day. No balance would be carried over to the following day. Each evening what you had not used would be deleted from your account – wiped away forever! Perhaps you are thinking this a wild idea, but the secret is that we each have such an account, measured in time. Every new day we are credited with 86,400 new, never-before-used seconds. It is up to us how we will spend them. They can be just frittered away. In that case, we have not gained a “heart of wisdom.” On the other hand, useful and beneficial things can be accomplished. • Find a balance. The woman of whom we read in Proverbs 31 was able to do many admirable things at home and in the marketplace. She had found a balance that we all need. How do we achieve such a balance? We need to realize that we don’t have to be part of every group and every pursuit and neither do our children. We must set priorities, and we must learn to say no to some activities. In setting those priorities, uppermost in our minds should be those things most necessary to have a close relationship with our Father, to be part of the Lord’s work of saving souls, and to take care of our families the best we can. Other pursuits should be less important. Prayer is one of the first things we need to find some time for. First Thessalonians 5:17 tells us to pray without ceasing. Obviously we cannot be in prayer every waking moment. This verse is telling us to always pray, to find some times every day for prayer, and to have a prayerful attitude at all times. James 5:16 says “the prayer of a righteous person has great power” (esv). We also need to find time for Bible study, which is the only way we can grow and attain the kind of deep faith we desire. Second Timothy 2:15 is often quoted for encouragement: “Study to shew thyself approved unto God, a workman that needeth not to be ashamed, rightly dividing the word of truth” (kjv). Ephesians 6:17 tells us to take on “the sword of the Spirit, which is the word of God” (nkjv). What do swords do? They protect us and keep evil from overtaking us and are certainly valuable to our souls. • Find time for others. Another worthwhile use of time is that of being hospitable. We don’t do as much inviting of people into our homes as we once did, but we can often become better acquainted when we do. One Christian author has written that others must sit in our chairs and eat at our tables for us to know them really well. It’s not that difficult to have someone over for a meal or even just coffee. We may think we cannot cook as well as some others or that our house is not clean enough. If a guest can feel that you really care, they do not notice those things. We have biblical examples in Mary and Martha, who were good at being hostesses. Time for older people and shut-ins is important too. James 1:27 says pure religion is to visit the fatherless and widows. In Romans 15:1 we read that we who are strong ought to bear the infirmities of the weak and not just please ourselves. Making time to attend all of the services of the church is important. This is somewhat controversial. Some do not think they need to be at all services. I have to wonder why they wouldn’t want to be, seeing that church members are the people with whom they hope to spend eternity. Children are the future of the church. Some time with them is needed to instruct them in the paths of the Lord. Nothing is more rewarding than helping a young person develop into a faithful Christian. Grandparents and other adults, as well as parents, can have a great influence in the lives of our young people if they will take some time to become friends with them and teach them. Remember the command in Deuteronomy 6:7: “You shall teach [God’s commands] diligently to your children, and shall talk of them when you sit in your house, when you walk by the way, when you lie down, and when you rise up.” That principle is just as necessary today. Take some time to be examples for younger women. Titus 2:4-5 instructs the older women to teach the younger. Indeed, how will younger women learn to love their husbands, to love their children, to be discreet and chaste, to be keepers at home, and to be obedient to their own husbands if they are not taught by word and example? What about time for husbands? We live in an age where their role has been diminished in many cases. The world is somewhat appalled that we would see the need to obey our husbands or that every home needs a father in charge. Yet when the Bible says wives should be in subjection to their husbands, it’s not just a suggestion. It is our duty. We were made to be helpers for our men. As wise wives, we will take time to encourage our husbands and spend some hours with them to develop that true oneness that Scripture mentions. The rewards are great. • Find time for yourself. Do we also need some time for ourselves? Jesus said to the disciples in Mark 6:31: “Come ye yourselves apart into a desert place, and rest a while: … they had no leisure so much as to eat” (kjv). The Lord knew the human body needs times of refreshing for the body, mind and spirit. A teacher once asked a youngster what his mother did in her spare time. He replied, “Mothers don’t do spare time.” It is true, in some cases, but we all need a little downtime. Most of us have fallen victim to procrastination at some time, or perhaps it has become habitual. Is there a cure? Researchers have suggested that if one can persuade herself to work on an activity for just a few minutes, on a regular basis, that individual often will feel the urge to see it through to completion. The Bible has many things to say about procrastination. In Proverbs 13:4 we read that the soul of the sluggard craves and gets nothing, while the diligent are richly supplied. Even more familiar is the passage in Ephesians 5:15-17 where we are told to walk circumspectly, redeeming the time. 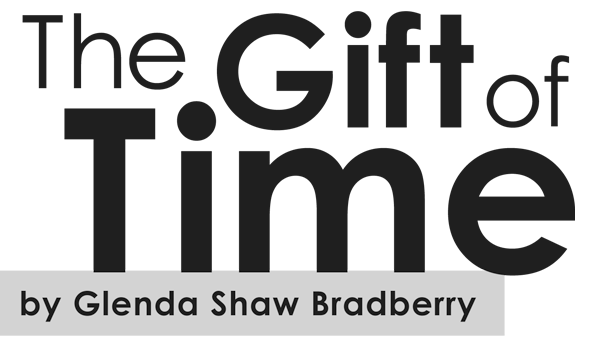 Glenda Shaw Bradberry and her husband, Tim, worship with the church of Christ in Briar, Texas, where he is an elder and she teaches ladies and children. They have four grown children, 14 grandchildren and 10 great-grandchildren. A retired schoolteacher, Glenda enjoys making quilts and entertaining people in her home and is the author of a recipe book, Pressed Down and Shaken.